Sarah surrounded by her family as she accepts the Osler Epilepsy Scholarship. Sarah tries not to think about the fact that she has epilepsy, despite the constant reminder of her Medic Alert bracelet that she wears around her wrist. “I have not let my struggles of having a neurological disease get in the way of having a full life,” said Sarah. Sarah is graduating as an honours student from Rideau High School and will continue her education at Algonquin College in the Developmental Services Worker program this fall. Sarah is taking this program so that she can learn how to help others with special needs. Sarah had her first seizure when she was thirteen months old, so she has experienced her whole life with epilepsy. One of the ways that people with epilepsy can cope with and mitigate the effects of the disease is through physical activity. For Sarah, this comes in the form of dance and swimming. “I have taken dance lessons since I was two years old and plan on continuing while I am in college,” said Sarah. For the last few years, Sarah was a member of a synchronized swimming team and has never let the fear of having a seizure in the water get in her way. Sarah with Cassidy Megan at Epilepsy Ottawa’s 2014 Purple Day celebration. 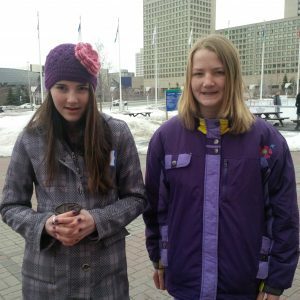 Sarah’s scholarship winning essay focused on Cassidy Megan, the founder of Purple Day, whom Sarah was actually able to meet at Epilepsy Ottawa’s 2014 Purple Day celebration. “We got to chat and skate together on the Rink of Dreams – a very appropriate place, since she had a dream at a young age and fulfilled it,” said Sarah. Cassidy inspired Sarah to face her epilepsy head on and to help others with whatever challenges they may be facing. 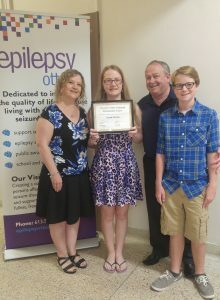 Epilepsy Ottawa would like to congratulate Sarah on her scholarship and wishes her the best in her studies.